Hello, my friends, it’s been a while. One week? Yes, and I am sorry. The last few days have been super hectic with this and that going on. I guess you can say, life gave me more bites than I can chew. 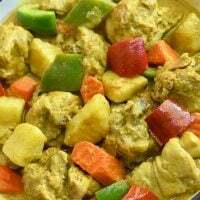 But I am here now and I bring for you this delightful mango curry chicken. from the dozen I bought last week from going to waste, I was pleasantly suprised of how wonderful it turned out. The chicken morsels were moist and flavorful and the sweet and savory gravy was just amazing spooned over generous helpings of steamed rice. Give it a try for dinner tonight and please share your thoughts on the comments below. Wash chicken and drain well. Season with salt and pepper to taste. Add 1 tablespoon of the curry powder and massage onto chicken. Marinate for about 30 minutes. In a wide pan over medium heat, heat oil. Add onions, garlic and ginger and cook, stirring regularly, until limp and aromatic. Add chicken and cook until lightly browned. Remove from pan and set aside. Add coconut milk to pan, scraping browned bits and pieces on bottom and sides of pan. Add remaining 1 tablespoon of curry powder, stirring until dissolved. Add mango chunks, mashing with back of spoon. Continue to cook for about 2 to 3 minutes or until slightly thickened. Make sure milk doesn't boil over so it doesn't curdle. Add chicken. Lower heat, cover and cook for about 8 to 10 minutes or until chicken is cooked through and sauce is reduced and thickened. Garnish with chopped cilantro, if desired. Serve hot.